Start off by clicking on the gear icon. How To Make Google UK Your Search Engine With Mozilla Firefox. So to do this, once again you will need to open your browser first. In the top left hand corner click on the Firefox drop down tab to bring up more options. Then you will click on the “Options” button to open up the corresponding window. Click on the General tab and next to Home Page you will see an open text box where you can enter your preferred address www.Google.co.uk. How To Make Google UK Your Search Engine With Safari. So to change your homepage with Apple’s Safari browser start by opening the browser then follow the instructions below. Click on the star icon and wait for the drop down to appear. Once you see the drop down you will want to click on preferences. Once the window has opened you can then navigate to the General tab and next to the “Homepage” text box add your search engine of choice. So that’s it for this post. We hope this helped you to achieve what you wanted to achieve. If not please drop us a message and we will try to help you. 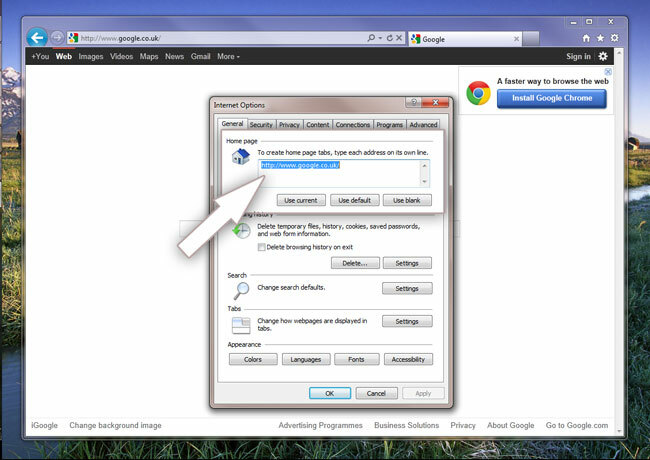 How To Make Google UK Your Search Engine With Internet Explorer. So to start off you will need to click on the gear icon in the top right hand corner on the browser. A drop down box will appear. Look for the “Internet Options” tab and click on it. When the box opens up, look for the “General Tab” once you’ve made sure that you’ve click on it you will see the Homepage section in the top area of the box under the General tab. You can simply enter your homepage of choice and click apply and ok. Main Page. To get your Google Chrome free download click here.